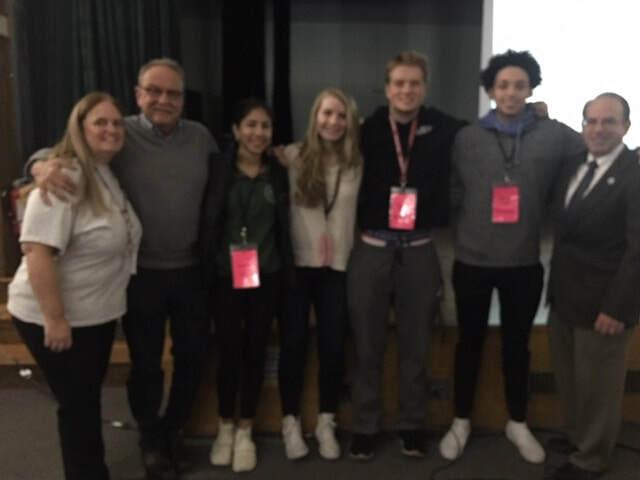 Falmouth's annual NO GUFF Week is a time when students and staff work together to create a positive atmosphere in the school and avoid name-calling and put-downs. In 2001, Falmouth High School adjustment counselor Greg Gilbert was working with a group of students t find a proactive way to handle conflicts. 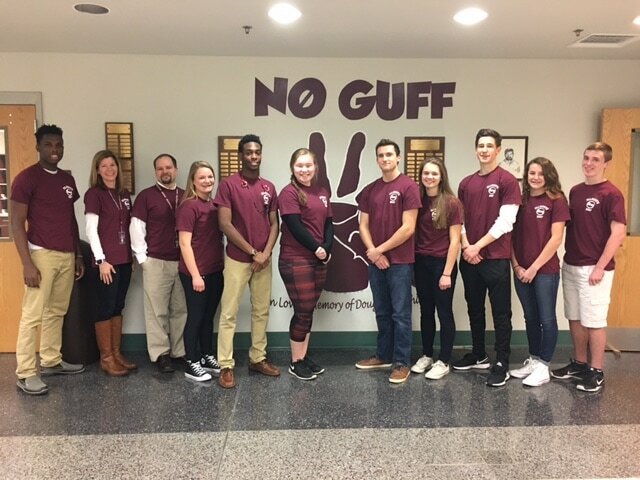 They came up with the phrase "no guff" and worked with graphic arts teacher Doug Riebesehl to print No Guff t-shirts for students. Shortly after that first celebration, Mr. Riebesehl was killed in a tragic motorcycle accident. Since then, No Guff has been held in his remembrance, as he empowered students to get involved in creating a positive atmosphere. Each year, students and staff are asked to take the No Guff pledge, which states: I will not speak or text anything negative about anyone for an entire day. Last year, seniors chose Sierra Abbott (a two-time winner) and Patrick Hodgson (a two-time winner) as their top choices. 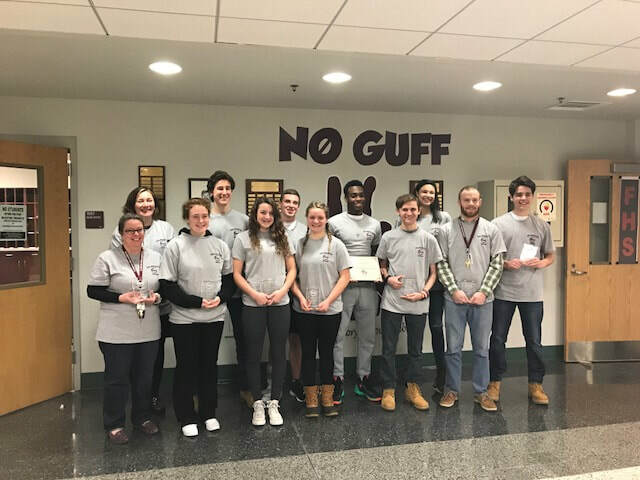 Juniors voted Danielle Shea (a three-time winner) and Nathaniel Evans (two-time winner) as their No Guff award recipients. Top sophomore vote-getters were Catherine Brodie (a two-time winner) and Grant Leachman. Freshmen selected Skylar Gonsalves and Trevor Hodgson as their award winners. Staff members voted colleagues Paula Carlson and Tom Ward as their top choices for this year’s No Guff recipients. In addition, Mary Gans awarded the Principal’s Award to FHS Sophomore Marvell Nicholson. This year’s NO GUFF Week marks the 18th annual observation of a tradition unique to Falmouth. No Guff Week s a time to celebrate respect and anti-bullying. No Guff Week encourages celebrations of respect, community, and unity. In the schools, it is a time when students and staff work together to create a positive atmosphere in the school and avoid name-calling and put-downs. 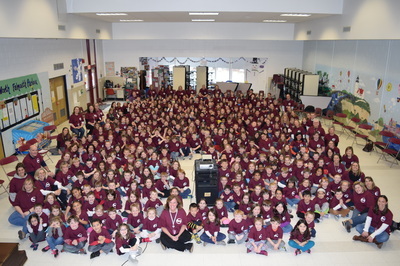 The theme for 2019 is “Do Good Things.” Local businesses Cavossa Disposal Corporation and Cape Cod Aggregates donated funds for this year’s NO GUFF Week t-shirts. 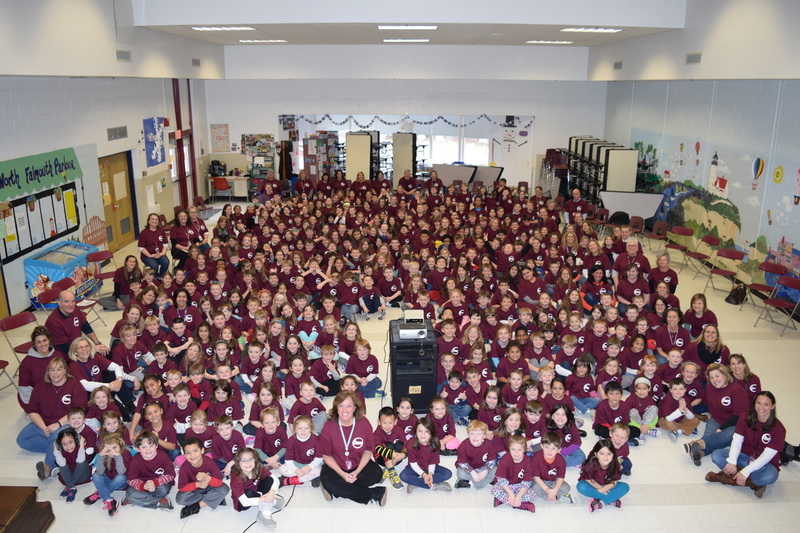 A NO GUFF Week video, produced by Morse Pond teacher Ann Goulart, will focus on "Be the Wind of Change" is will debut on Monday, January 28th at the annual No Guff Week kickoff assembly at Morse Pond. 2019 marks the 6th year that the No Guff Community Spirit Award has been bestowed upon an individual who exemplifies the No Guff spirit in his or her daily life. Nominees must reside in Falmouth; staff and students of Falmouth Public Schools are not eligible as awards are given within the schools). Voting for this year has closed, but you can start thinking about your 2020 nomination!